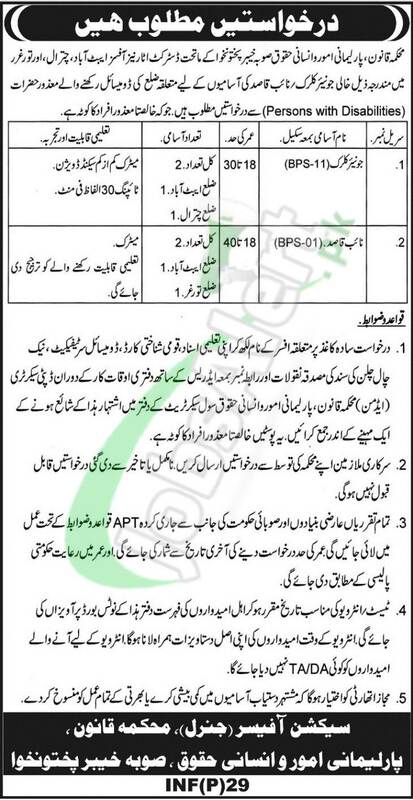 Here you'll get Apply in Law Parliamentary Affairs and Human Rights Department KPK Jobs 2019 Current Opening announced for the KPK Domiciled holders belongs to Torghar, Abbottabad, Chitral. Jobs in Law Parliamentary Affairs and Human Rights Department KPK to apply are such as (Junior Clerk and Naib Qasid) 08 Posts are announced to apply as soon as possible on contract basis. Candidates willing to apply are suggested to compare themselves with the eligibility criteria mentioned in the following image such as for both posts Matric pass can apply before the last date 02nd February 2019.